What Kind of Harp Does She Play? Mary has two harps, which are known as pedal harps, because they have pedals for making sharps and flats. The looks and sounds of both of these beautiful instruments grace a room with richness, resonance and refinement. 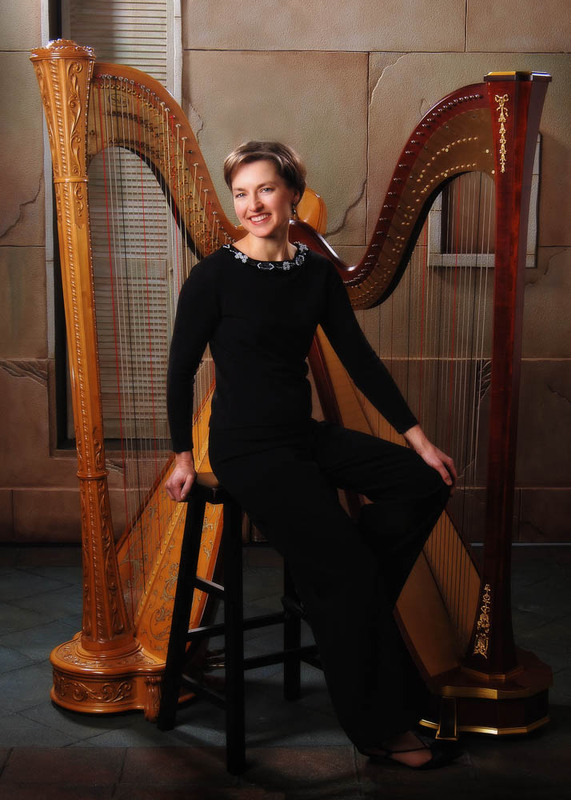 One of her harps is a 47 string, concert grand Italian-made harp. It has an intricately hand carved column, hand-painted silver scrolling on the sound board and a highly polished maple finish. It has a smooth and developed sound. Mary also plays a 44 string semi-grand Italian-made harp. This slightly smaller, and more portable instrument, has a mahogany finish, with an angular column decorated with brass filigree. This harp has a more jaunty tone quality. What Kind of Music Can She Play? All types of music can be played on what is known as a pedal harp, the two harps that Mary plays. Mary plays classical pieces, which is what everyone expects from a harp. But she also has an extensive repertoire of popular music dating back from the 1920’s, up to more contemporary music by Sting and Shania Twain. Mary also includes many songs from Broadway hits, including those by Andrew Lloyd Weber. Some people ask whether or not Celtic music can be played on these larger harps and the answer is YES! Celtic music, as well as Irish, Scottish, and Welsh folk music, and folk music from other countries, sound wonderful on a larger harp. Please visit the “Playlist” page for a partial list of folk music that she plays. Will She Come With Her Harp to Where My Event is Being Held? Mary primarily works in the Milwaukee, Waukesha, and Washington counties of southeastern Wisconsin. However, she has been known to drive to Ozaukee County, Sheboygan County, Brown County and even Door County for events. If you have any questions in this regard, please contact her. Does She Play With Other Instruments? There is a wonderful array of classical repertoire for these various ensembles. For more information about availability and rates, contact Mary today.